On March 17, pioneering rock 'n' roll legend Chuck Berry died at the age of 90. Berry’s hard-driving guitar riffs, car and party songs, and fluid lyrical style helped usher in a new genre of music that inspired a generation of rock bands from the Beach Boys to the Rolling Stones. Berry had hits on the Billboard charts in the ’50s, ’60s, and ’70s and performed live shows almost up to the time of his death. He was inducted into the Rock & Roll Hall of Fame in 1986. Berry’s music tugged at a universal thread of teen culture and drew integrated audiences to his music and live performances at a time when the Supreme Court was deciding the watershed case Brown v. Board of Education that found racial segregation violated the Equal Protection Clause. I invited Associate Professor Mark Burford [music 2007–] to talk about Chuck Berry’s influence on music and culture of the 1950s. Burford is a music historian with expertise in 19th-century Austro-German concert music and 20th-century African American popular music. His work on European art music and popular music of the Americas has appeared in the Journal of Musicology, 19th-Century Music, Current Musicology, Notes, and Musical Quarterly. 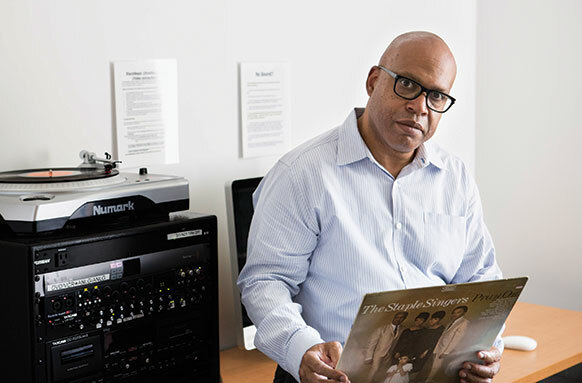 He is a recent winner of the prestigious Irving Lowens Article Award for his article on Sam Cooke that was published in the Journal of the American Musicological Society. The award is bestowed annually by the Society for American Music in recognition of an article that makes an outstanding contribution to American music studies. Burford has recently completed the book manuscript, Mahalia Jackson and the Black Gospel Field, and is currently working on a second book, Receiving the Spirit: Doing Black Gospel in Postwar America, that explores how black gospel singing in the U.S. between 1945 and 1963 blossomed and became a galvanizing force in the Civil Rights Movement. Before coming to Reed in 2007, Burford taught at the Weill Music Institute at Carnegie Hall, Columbia University, and City College of New York. He received a BA in music from the University of California at Santa Barbara and MA and PhD degrees in historical musicology from Columbia University.